After England’s success in the 1966 World Cup it was felt in many quarters that Sir Alf Ramsey’s men would remain at the pinnacle of the game for some time. With many of the ‘66 team still at their peak and with a number of promising youngsters on the horizon it was hard to see Ramsey’s men being knocked off their perch in the foreseeable future. Scotland meanwhile had finished a disappointing second to Italy in their World Cup qualifying group with a home defeat to Poland proving the pivotal result. The Jock Stein-led team (the Celtic boss took charge on a part-time basis after Ian McColl, who had been manager for the first game, left the post) still went into their final match in November 1965 level on points with the Italians. But they crashed 3-0 in Naples to seal their fate and miss out on the chance of competing in the game’s premier competition on their doorstep. England had begun their 1966-67 international campaign with a fairly comfortable 2-0 win in Belfast where Ramsey’s men, fielding the XI that had won the Jules Rimet trophy three months before, scored through Hurst and Hunt. 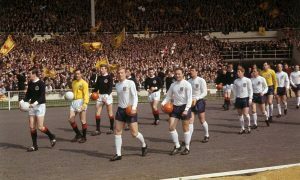 It was the same line-up again for the goalless draw with Czechoslovakia at Wembley in November and again for the 5-1 win over Wales in the same month. 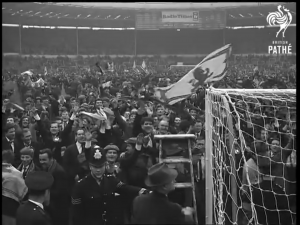 It was to this backdrop that the England – Scotland match took place on 15 April 1967. 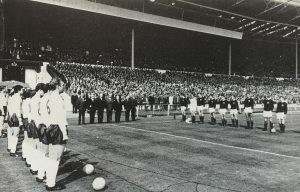 As well as being a home international the match also formed part of qualification for the 1968 European Championship. The home countries were combined in one group and qualification would be decided by results from the 66-67 and 67-68 Home International tournaments. The England line-up on that day showed just one change from the side that had captured the World Cup with Jimmy Greaves preferred to Roger Hunt as Geoff Hurst’s partner up front. New Scots boss Brown made an immediate impact on selection, bringing in two men at opposite ends of their careers. He gave debuts to Ronnie Simpson – formerly Brown’s own understudy as national team ‘keeper and to Sheffield Wednesday starlet Jim McCalliog, who had been outstanding in the Under-23 win against England at Newcastle in March. Both were to play major roles in the team’s win. At 36 Simpson was approaching the end of an extremely long and distinguished career which would eventually result in over 600 games a European Cup winners and numerous other medals. After starting out with Queen’s Park where he made his first appearance aged just 14, he was chosen by Matt Busby to represent Great Britain at the 1948 Olympics and then, after completing his national service, joined Third Lanark in 1950. Within six months he moved south, joining Newcastle United for £8,750. He won two FA Cup winners medals whilst at St James’s Park and spent nine years at the club making over 250 appearances before moving back north in 1960 and signing for Hibernian. When Jock Stein took over as manager he fell out with Simpson, citing his attitude in training as a problem, and sold him to Celtic for £4,000. Within months Stein had ironically also moved to Celtic and Simpson found himself working with him again. Clearly his attitude had improved by then and having been signed primarily as cover for John Fallon, he became the team’s first choice after Fallon took the blame for the 1964 League Cup final defeat by Rangers. 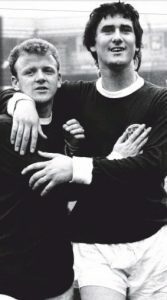 Known as ‘Father’ by his teammates due to his age, Simpson would continue to play for the team until 1970, winning four league titles, three League Cups and a Scottish Cup to go along with the European success. He was forced to miss the 1970 European Cup final defeat to Feyenoord due to injury and retired shortly after bringing to an end a career that spanned 25 years. McCalliog would later play for Wolverhampton Wanderers, Manchester United and Southampton. Whilst at Wolves he received another runners up medal as part of the team that lost the UEFA Cup final to Tottenham Hotspur and at Southampton, finally, he got a winners’ medal when he was part of the team that beat Manchester United in the 1976 F.A. Cup Final, providing the pass for Bobby Stokes to score the only goal of the game. Beyond the debutants Brown’s selection recognised the excellent season Celtic were having with the inclusion of three of Simpson’s club mates in Tommy Gemmell, Bobby Lennox and Willie Wallace. Two others who would go on to be “Lisbon Lions”, Bobby Murdoch and Jimmy Johnstone, were injured and unable to take part. 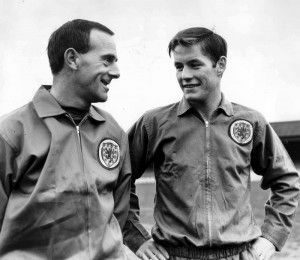 Rangers were represented by skipper John Greig and centre-half Ron McKinnon with the remainder of the side made up of ‘anglos’ (Scots plying their trade in English football). 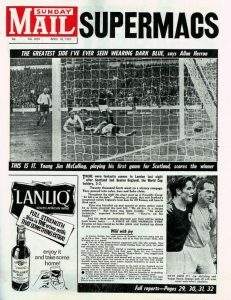 Alongside McCalliog, Eddie McCreadie, Billy Bremner, Denis Law and Jim Baxter completed the line-up. There was some controversy over the inclusion of Wallace in the Scottish line-up. Frank McLintock and Steve Chalmers had travelled to London as the team’s two reserves. 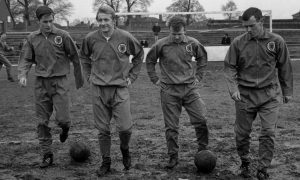 Johnstone was in the original line-up but was withdrawn by Celtic boss Jock Stein due to a thigh injury and it was Wallace and not Celtic teammate Chalmers who was called in to replace him. According to Chalmers the decision to leave him out of the starting XI was made by the SFA, alongside Stein, rather than Brown. “I should have been in that team but I don’t think Bobby Brown would have been confident enough to tell the SFA or anyone else that he had a player in place and didn’t need a replacement.” Chalmers would later say. It is very likely that Stein had a big say in the decision. Celtic had played Dukla Prague in the European Cup semi-final on the Wednesday prior to the England game (where Johnstone had picked up his injury) and had secured a 3-1 win. For the return Stein would play Chalmers as his front man and he wanted him well rested. Baxter was a key figure. Described by none other than Sir Alex Ferguson as ‘arguably the best player to play in Scottish football’ and ‘the greatest player I’ve ever played with’ Baxter started his career with Raith Rovers before joining Rangers for a Scottish record fee of £17,500. 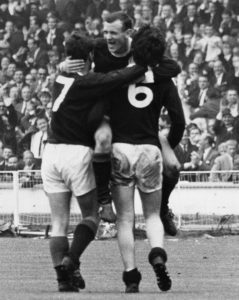 During his time with the Glaswegians he was chosen for the Rest of the World team that played England as part of the F.A’s centenary celebrations and he became a key player for both club and country, scoring both goals and starring in his Scotland’s win at Wembley in 1963. He left Rangers for Sunderland in 1965 for £72,500, at the time the highest amount ever paid to a Scottish club. But since moving south his form had arguably dipped, although still showing flashes of brilliance and he would leave Sunderland later in 1967 for Nottingham Forest. He never really repeated the successes he’d had in Scotland, or for the national team, during his time south of the border but the class and the ability to run games was still apparent. This was another trip to Wembley that Baxter certainly enjoyed and the Scots were clearly full of optimism. As skipper John Greig would later say, “on the surface at least we had no reason to feel confident but we were desperate to make a point”. 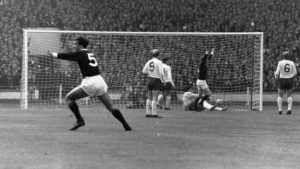 Baxter took control early on and Scotland were the better team even before Jack Charlton was injured after a 13th minute clash with Bobby Lennox. Charlton had gone in high to challenge Lennox but came off worse when a stud was forced back into his own foot breaking a toe. He left the field for 15 minutes and spent the rest of the game up front and ‘hopping on one leg like an unhappy stork’ according to one reporter. There were a number of feisty challenges early on as the Scots let their hosts know that – World Champs or not – they were in for a tough afternoon. 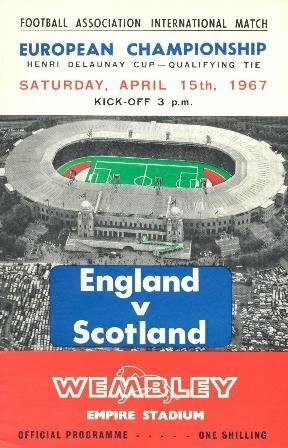 In front of a 100,000 crowd that contained upwards of 30,000 Scots it came as no surprise when, in the 27th minute, the visitors took the lead. 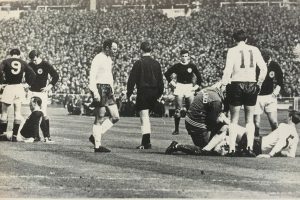 Willie Wallace’s effort was saved by Gordon Banks but Denis Law was on hand to tap home the rebound and England’s 19-game unbeaten run was in jeopardy. By the time the goal came it was Scotland who were playing with 10 men. Charlton had returned (albeit up front) and Tommy Gemmell left the field briefly after a challenge by Ray Wilson. 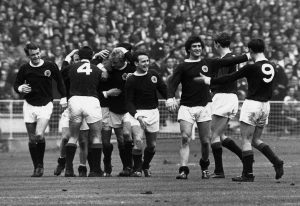 But the Scots were well on top with the combination of Greig, McKinnon and Baxter dealing comfortably with the hosts’ attacks and Baxter, alongside Bremner, constantly probing the English defence and creating opportunities for the front men. England, with Charlton limping on the wing, were second best and had some fine saves from Banks to thank for not being further behind. 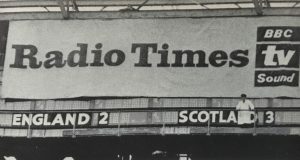 The big surprise was that it took until the 78th minute for Scotland to double their lead, Lennox smashing home from 15 yards after being set up by fine interplay between Bremner and Law. At this stage the visitors were toying with England and putting on a show with Baxter displaying off his keepy-uppy skills and taunting the opposition. Five minutes from time England surprisingly got back into the game when makeshift forward Charlton halved the deficit. 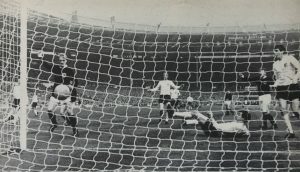 In fact the injured defender had gone closest to scoring already for the hosts, forcing a save from Simpson and this time he beat the veteran keeper from close range after being set up by Alan Ball. The Scots went straight back on the attack and an audacious chip from Law produced a fine Banks save. Shortly after, Bremner broke up an England thrust and passed to Lennox who sent the ball on to McCalliog. A 1-2 with Wallace allowed the youngster the opportunity to slam the ball past Banks for a debut goal. There was still time for Hurst to make it 3-2 with a looping header but the Scots comfortably held on for a deserved win. After England lost for the first time since October 1965, manager Sir Alf Ramsey praised the opposition saying. “I said it would be a great team that beat England. We are still a great team. Which says everything that needs to be said about the Scottish performance”. 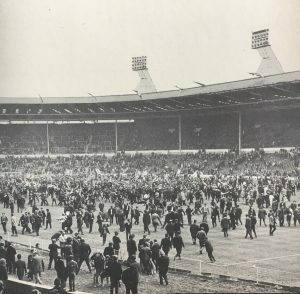 So Scotland ended England’s unbeaten record and in doing so, claimed the unofficial ‘World title’ and, just as Baxter had celebrated during the game, their fans celebrated after, invading the pitch and London’s West End where they partied through the night. What might have been the start of a Scottish ascent to the pinnacle of World football ended as quickly as it had begun. During the following season’s Home internationals they lost 1-0 in Belfast and could manage only a 1-1 draw in the rematch with England at Hampden meaning they finished a point behind Ramsey’s men in the quest to qualify for the European Championships. On the club scene Scotland was just as dominant in 1967. Celtic had an amazing season. winning every competition they entered whilst Rangers and Kilmarnock also had fine European campaigns. All of that will feature in part two of ‘1967; When Scotland Ruled the World’.